A beach in North Yorkshire has been named one of only 10 in England which failed to meet minimum European water quality standards. The beach at Staithes has consistently fallen below standards set by several bodies over the past 20 years. It has now fallen short of new tougher standards set down by the European Commission in 2010. 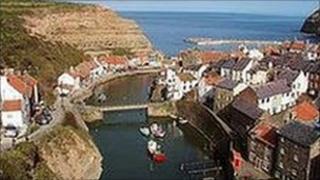 The Environment Agency said the bathing waters at Staithes were affected by farm sewage draining into the harbour. The agency's water quality manager Dominic Shepherd said: "The bathing water is in a small enclosed harbour which is affected by a beck that drains a predominantly agricultural area, and can on occasion, receive diluted sewage from overflows during stormy conditions. "Breakwaters compound the issue by keeping the water within the harbour and limiting dilution from the sea. "As a result this presents a high risk to bathing water quality." Earlier this month, Yorkshire water announced a £100m five-year plan to improve a 50-mile stretch of coastline from Withernsea to Staithes. The Environment Agency said it was working with Yorkshire Water and local farmers to identify and tackle any sources of pollution. "The location of the bathing water means that it will always be very difficult to achieve the bathing water quality standards at Staithes," said Mr Shepherd. "However, we are taking action so that we have the best chance of meeting the standards in the future." The latest figures published by the Department for Environment, Food and Rural Affairs (Defra) show that 86% of bathing waters in England and Wales met the new European guidelines in 2010. This year, 10 of the 493 beaches and bathing spots monitored failed to meet minimum standards, compared with seven out of 495 tested last year. Even tougher standards come into force from 2015, but already more than 80% of beaches in England and Wales are clean enough to meet the new measures, the Environment Agency said.